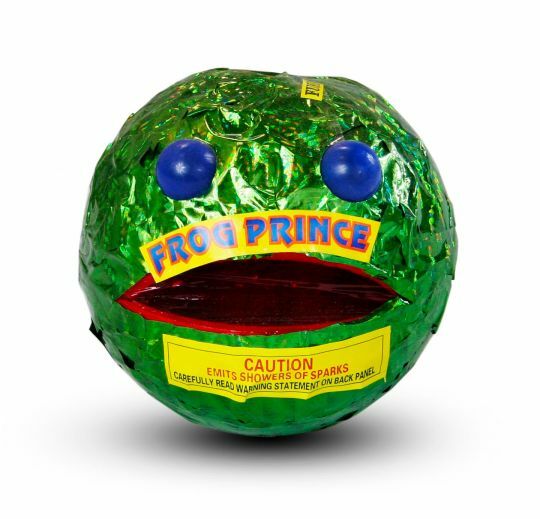 Despite its really odd name, Frog Prince is a great fountain that is unlike any other we carry. The face-shaped fountain lights up through the eyes and mouth as sparks fly from the top. Total duration is about 40 seconds, and includes lots of color and loud titanium-crackle! Frog Princess is identical to Frog Prince, except it is pink instead of green. The face-shaped fountain lights up through the eyes and mouth as sparks fly from the top. Total duration is about 40 seconds, and includes lots of color and loud titanium-crackle! The Alien Fountain whistles with a strobing glow as part of a great display that includes showers of sparks, crackle, glitter, and purple flame drops. Red, blue and purple torches with silver shower in all directions, followed by red and blue stars with crackle in the middle, then crackling with red stars.